Dec 15, 2016 (LBO) – Sri Lanka’s Prime Minister today expressed his gratitude to the Navy Commander and the entire staff for rescuing the two ships that were forcibly detained at the Hambantota Port. 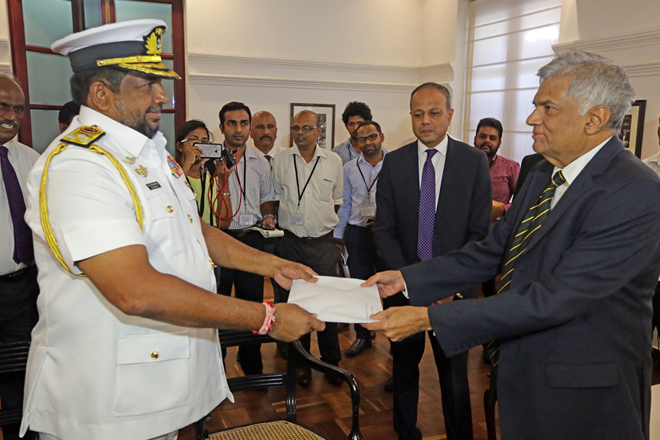 Prime Minister Ranil Wickremasinghe revealed that a Bill has been sent by K-Line shipping company mentioning that a loss of 400,000 US dollars should be paid on behalf of forcibly detaining a vessel. Navy Commander Vice Admiral Ravindra C. Wijegunaratne handed over the report on the Naval operation carried out at Hambantota Port to Prime Minister at Temple Trees today. Expressing views Prime Minister further said that two Shipping Companies contacted him and said that their ships are stranded and the vessels may be damaged. “At this instance I discussed with the President and Defence Secretary and thereafter called on the Navy to launch an operation to save these vessels,” Wickremasinghe said.